SAF-West wins business of the year award. SAF – Southern Aluminum Finishing Co, Inc.
Redding, CA – March 10, 2016 – As part of the Greater Redding Chamber of Commerce’s annual “2016 Winter Gala: Honoring Local Legends & Leaders” held Friday night, February 26, 2016, the Chamber presented the 2015 Business of the Year award to Southern Aluminum Finishing (SAF). 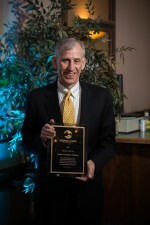 Jim McClatchey accepted the award on behalf of the company. The annual award recognizes a business distinguishable by their investment in Redding’s employment, development, and community involvement. In issuing the award, Redding Chamber of Commerce CEO and President, Jake Mangas acknowledged SAF’s 70 year history and the opening of their SAF-West branch in 2007 that has grown to more than 50 full time, manufacturing employees. Representatives from the City of Redding Mayor’s office, Shasta County Supervisors, the California State Assembly and the U.S. Congress also recognized the award during the ceremony with commemorative certificates and plaques. Background Based in Atlanta, Georgia, SAF is a nation-wide aluminum extrusions and sheet distributor, metal fabricator, and aluminum finisher specializing in Kynar painting and architectural anodizing. SAF also distributes column covers, architectural panels, and commercial roofing trim to architectural specifiers, glazing contractors, and other industries. The SAF West branch opened in January, 2007 and serves Western US, Canada, and Pacific Rim markets.